New York City or really any major city in the world is in a constant state of change. Old buildings are being torn down while new ones rise up to take their place. Even more buildings are finding themselves remodeled to meet the needs of their current occupants. New business are starting up while others are shutting down. New bike sharing programs are being added to the streets while old rail lines are becoming public parks. I received a reminder about this fact of life when I saw this wonderful collection of photographs of New York City in the 1990s. I always find it somewhat remarkable seeing pictures of old businesses that no longer exist even going back to the not-too-distant past of the 1990s. Pictures like these are a good way to tell what has changed and what has stayed the same over time. That was back when MTV actually broadcasted music. One of the coolest new things to recently come into existence in Manhattan was the High Line. What used to be an elevated rail line in the Lower West Side hasn’t seen a train roll over it since 1980 and sat abandoned and deteriorating for almost twenty years. The line was almost completely demolished in the late 1990s until some concerned citizens convinced the City Hall that they had a better plan for it. Since 1999 there has been a lot of work done to transform the rail line into a beautiful public park for all to enjoy. The first third of the new park was opened to the public in 2009 and the second third was opened up in 2011. Construction for the final third of the High Line began last year and is scheduled to open in 2014. However, there is one big piece of recent news regarding that final section under construction. For the first time, detailed plans and renderings of the completed northern section of the High Line were released to the public and those pictures look incredible. Especially impressive was the plan for the northeastern terminus which will look like a big bowl surrounded on all sides by trees and overlooking the Hudson River and 10th Avenue. The High Line is an incredible example of our ability to transform an obsolete eyesore into a beautiful attraction and I for one can’t wait to see the finished result next year. New York likes their trains underground now. Churchill has short-term corporate housing available in New York and Nationwide. For more information please contact us at 866-255-0593 or National@FurnishedHousing.com. New York City wasn’t always the metropolis it is now. For one thing the city limits of New York City used to be just Manhattan. It wasn’t until 1898 that the five boroughs joined together to become the city it is today. There was also far less people and it was much harder to get around. Getting from Brooklyn to Manhattan is now a common subway ride for most New Yorkers. That ride used to be a dangerous boat ride across the East River. If you could somehow teleport yourself to New York City 175 years ago you would probably have no idea where you were. Now it is possible to be able to somewhat imagine what Manhattan was like back then thanks to this new interactive map from the Smithsonian. With this map they’ve combined a map of Manhattan from 1836 with a satellite image of the city today and you can see the differences. Back then you can still see the general patterns of the streets and avenues which largely remain the same today. However, there are huge amounts of empty space on the island and it gets emptier the further north you go. Even as far back as 1836 the area we call Harlem today was mostly just vacant land. In fact, it didn’t look like there was much in the way of development north of 42nd street. Seeing how comparatively undeveloped the city was back then makes you really appreciate how far it has come in so short a time. 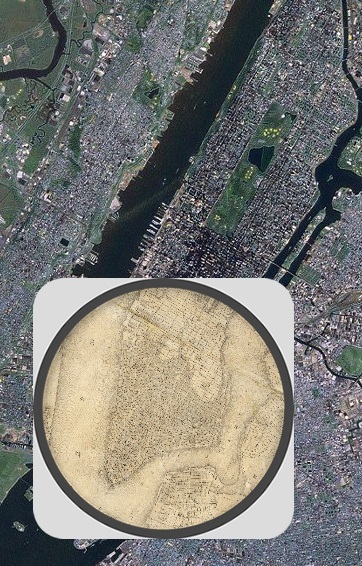 This map is a really cool glimpse into New York’s past and well worth checking out. Churchill has short-term corporate housing available in New York City and Nationwide. For more information please contact us at 866-255-0593 or National@FurnishedHousing.com. New York City’s architecture is a wonderful mix of young and old. The two most impressive buildings on the Manhattan skyline are the Empire State Building and the nearly complete World Trade Center One. Those buildings were constructed 82 years apart and looking at those two buildings side by side from a distance gives you a great sense of where we came from and where we are going. This mix of old and new doesn’t just apply to Manhattan skyscrapers either. Cross the East River and you will find a similar mix in the (shorter) buildings of Brooklyn, Queens, and the Bronx all of which have buildings still standing since before 1825. Thomas Rhiel recently undertook an impressive project to visually illustrate this mix in Brooklyn. 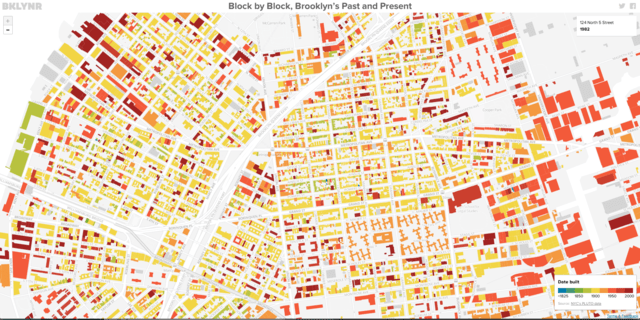 After going through the building records of more than 320,000 buildings he has put together a color-coded interactive map of Brooklyn with each building shaded depending on its age. This is a truly incredible project that reveals things that I never knew about Brooklyn in a very easily accessible way. It’s well worth checking out. If I had a dollar for all of the times a New York City mayoral candidate said some version of that I’d be a millionaire. But for many of us New York outsiders, we too often equate New York City with just Manhattan and sometimes Brooklyn while leaving out the Bronx, Queens, Staten Island, and the other smaller islands that are as much a part of the city’s fabric and history as everywhere else. There is a recent article in the New York Times that recommends some really cool parts of the city outside of Manhattan. Roosevelt Island in the East River has a great deal of well-preserved nineteenth century architecture and is well worth exploring. It was originally the home of many of New York’s prisons and mental hospitals before the former moved to Rikers Island in the 1880s. The southern end of the island boasts the recently completed Franklin D. Roosevelt Four Freedoms Park which has incredible views of the Manhattan skyline and was decades in the making. The northern end of the Roosevelt Island has a remnant of a mental hospital where legend has it that an inmate built a fort to defend against a future British invasion of New York. This picture should tell you how well the fort worked. Also mentioned is Wave Hill in the Bronx. This grand old manor was rented out to some rather famous people in our history including future President Theodore Roosevelt when he was a child, and Mark Twain in his later years. It is one of those oases in New York where you find it hard to believe that you’re in the biggest city in the country. The article also shows some love for Staten Island’s Snug Harbor. Snug Harbor was originally built as a retirement home for old sailors and it now has a beautiful botanical garden and is a local center for the arts. The area has been a historical landmark since the 1970s boast some wonderful architecture directly inspired by ancient Greece. New York is a big and wonderful city and all of the boroughs have a lot to offer. The next time you’re thinking of checking out New York, try looking for cool places in the outer boroughs. You’ll be surprised at what you may find. 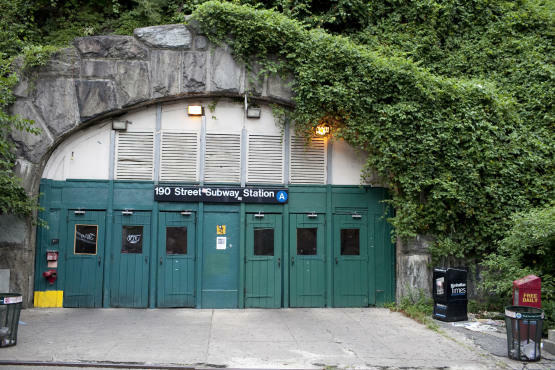 While many who hop on the NYC subway system for their daily commute may find little to say about the mundane ride, Time Out New York featured an interesting article (and slideshow) about five of New York City’s most interesting subway stations and their histories. This Bushwick L stop is located within a car dealership! The station opened in 1928, long before the car dealership. Its entryway is a small unremarkable building but inside you’ll find colorful tiles on the Manhattan & Brooklyn bound platform. Designed by Squire Vickers during his 36-year run as the chief architect of the subways, this bi-level Borough Park stop on the D line is considered one of the best examples of his work. It was designed in the Arts & Crafts style with an above ground control house and colorful ceramic tiles. Trains used to travel on both tracks but the lower level track was discontinued in 1975. You may even recognize this station from Crocodile Dundee, the sequence that was supposed to take place at the Columbus Circle Station was actually filmed here. This subway station was opened in 1932 on the A line. It is exceptionally picturesque resting high atop a tree-covered hill outside of Fort Tryon Park. Since it is located in one of the highest points in Manhattan, this is one of the deepest stations in the transit system. Its located 140 feet underground! This subway platform reaches a whopping 87.5 feet tall and opened in 1933 to service the F and G lines. It is the highest subway station in the world located on the Culver Viaduct, a mile long overpass connecting Carroll Gardens to Park Slope. While the station has been closed for renovations for the past year, it is set to reopen in the fall. From this platform one can see some of NYC’s most impressive landmarks such as the Statue of Liberty, the Williamsburg Savings Bank Tower, and One World Trade Center. The 72nds Street station is one of three to feature an above-ground control house designed by Heins & LaFarge, the firm that was responsible for the architecture of the earliest subway stations. Opened in 1904, it is located on the south side of 72nd Street. In 2003, a similar style station was opened on the north side in order to help alleviate overcrowding in the busy one line station. Next time you find yourself trolling up and down the tracks with a few minutes to spare, stop off at some of these locations for a unique view of these old fashioned subway stations. Churchill has short-term corporate housing available in New York City and other cities Nationwide. Please contact us at 866-255-0593 or NewYork@FurnishedHousing.com for more information. In 2001, racer Alex Roy set a record by circling Manhattan in 27 minutes. Now, a new driver has broken the record by completing the feat in 26:03. The total time is amazing (considering the stop lights) for the 24.48 miles journey, which averaged about 56 mph. Churchill has short-term corporate housing available in New York City and Nationwide. Please contact us at 866-255-0593 or NewYork@FurnishedHousing.com for more information.